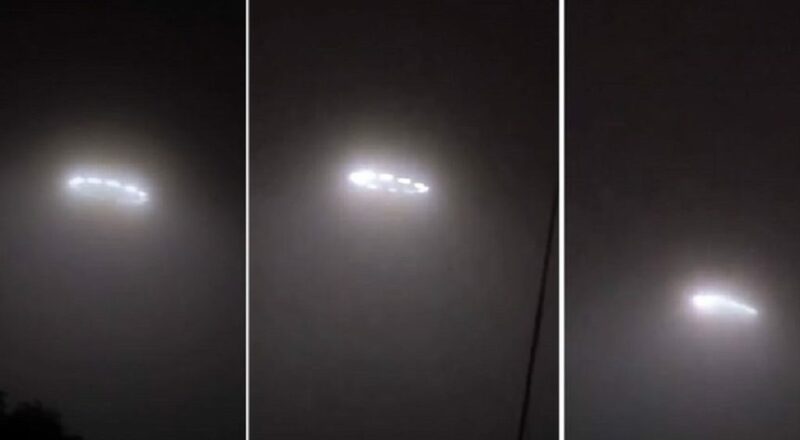 Witness report: Today October 28, 2018 I witness 5 UFOs hovering over Rosarito, Baja California MX. At around 4:23am I was driving back to San Diego, California with my grandmother. We were having a normal conversation when she suddenly went mute and all she could do was point at the sky. I look up and see 5 of these things hovering over homes and the beach. I pulled over and immediately went live on instagram to avoid speculations of video editing and such. When I moved to Atlanta in October 2015 my dad stayed for two days as he then headed back. While he was flying after a storm had ended he spotted a bright object in the sky. He was flying around 30,000 feet. Wanting to test his new iPhone 8 that he had he took a picture of the star. 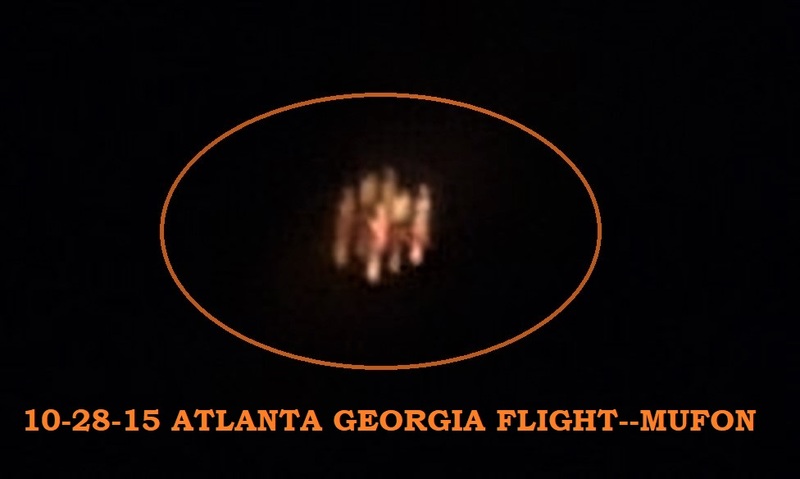 He stayed in Atlanta for several days but after six days of taking the photo he zoomed in it to realize it wasnt what he thought it was. 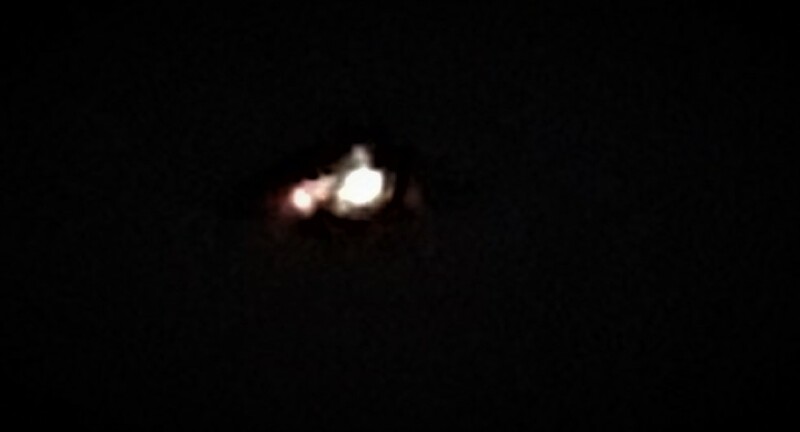 He sent me the live picture of the UFO and if you see the picture it looks like a castle like ship where the tower like structures were spinning. The red ‘ribbon’ was moving or flying around the ship. My dad was flying around 30,000 feet and it seemed like it was about 35,000 feet above the plane. My dad knows that we’re not alone but still was a skeptic till he saw this and after I saw the live trippy picture he still can’t find a way to call it ours. Reminder: my dad witnessed this but asked me to submit this. I too have witnessed many anomalous events as well. The night was clear with stars all around, moon glowing over ocean but behind clouds to the west. I was at the Coffee barn working, heard quick whooshing sound above me and I looked up towards sound to the North East. My reaction was caught on our security camera at 11:29 pm for 16 seconds, total event. 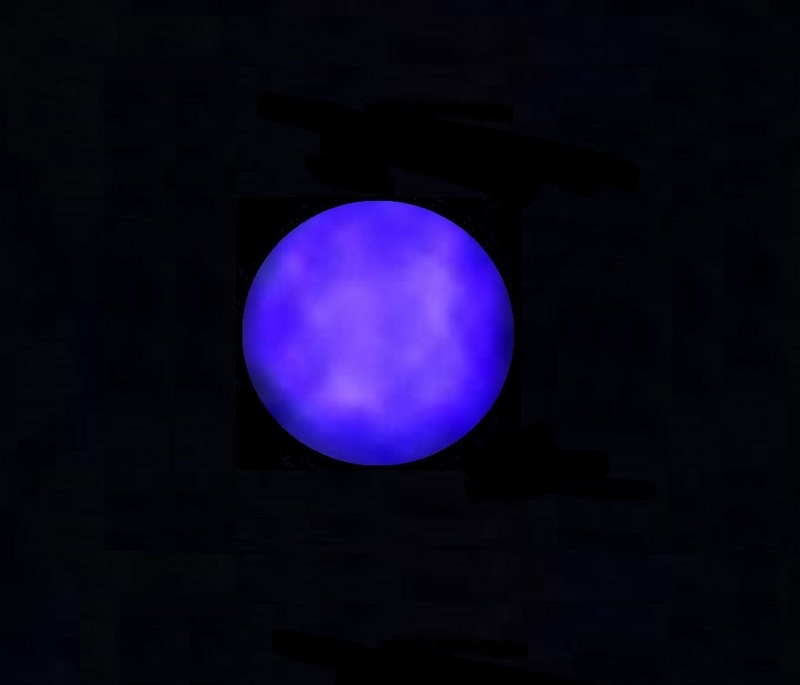 At first I thought “that is no falling star,” huge neon blue ball of light glowing and descending slowly. It spun clockwise and I could see windows clearly outlined in black. 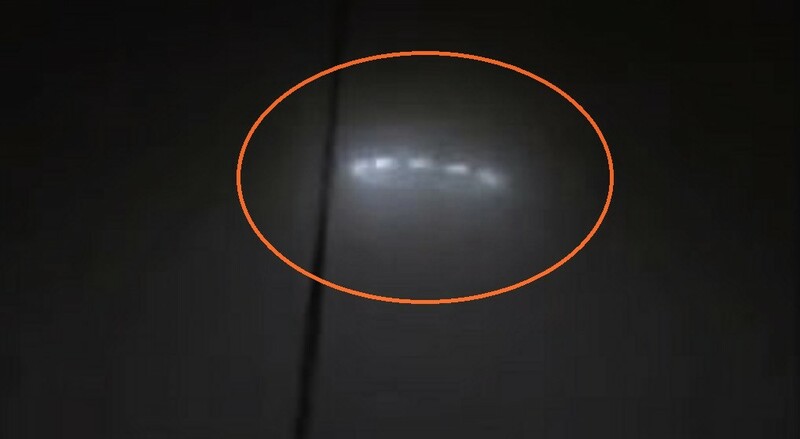 Inside ring of windows, it was white and towards inner center different, sky blue that did not appear to be solid. Forest lit up blue around the object as it came straight down into the forest, bright white light lit up the rest of the forest up to 100 yards in front of me. I lost sight of it as it appeared to land in the forest, up to maybe 1/2 mile to a mile away from me. Darkness and silence as I waited to hear a crash sound or the forest to catch on fire. There was no crash sound or any sound (coqui frogs were also silent) after it appeared to land and my horse ran off a mile in other direction, (neighbor called me.) The silence was eerie and the hairs on the back of my arms stood up. I was scared and walked to the house to get my partner and walked back out to silence and reviewed security camera. Asked a friend to check the radar and web cams but found nothing. (We are at 19.33 degrees North Longitude.) NOTE: The above image is CGI. The government has long covered up these kinds of UFO incidents, asking service personnel to not discuss the details but the case of the USS Nimitz and a UFO encounter its crew had on November 14, 2004 have since been independently confirmed by two former senior Pentagon officials, Christopher Mellon and Luis Elizondo, who have spoken directly to some of the pilots involved, read more here. Below: Extract taken from the Official Navy event document 2004. 1. Fast Eagles (F-18 110/100) upon take off were vectored by Princetown and Banger to intercept unid contact. Princeton informed fast eagles that the contact was moving at 100 KTS – 25KFT ASL. 2. Fast Eagles (110/100) could not find unid airborne contact at location given by Princetown. While searching for unid air contact, Fast Eagles spotted large unid object in water at 1430L. Pilots saw steam/smoke/churning around object. Pilot describes object initially as resembling a downed airliner, also stated that it was much larger than a submarine. 3. While descending from 24K FT to gain better view of the unid contact in the water, Fast Eagle 110 sighted an airborne contact which appeared to be capsule shaped (wingless, mobile, white, oblong pill shaped, 25-30 Feet in length, no visible markings and no glass) 5NM west from position of unid in water. 4. Capsule (UFO) passed under Fast Eagle 110 then Fast Eagle 110 began turn to acquire capsule. While 110 descending and turning, capsule began climbing and turned inside of Fast Eagle’s turn radius. 5. Pilot estimated that capsule achieved 600-700 KTS. The 110 could not keep up with the rate of turn and the gain of altitude by the capsule. 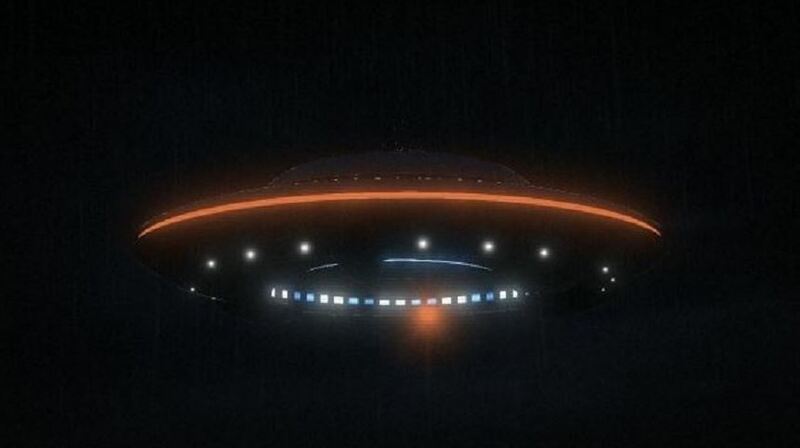 110 lost visual ID of capsule in haze. Last visual contact had capsule at 14 KFT heading due east. 6. Fast Eagle 100 was flying high cover and saw the engagement by Fast Eagle 110 and confirms 110 visual ID. 100 lost contact in haze as well. 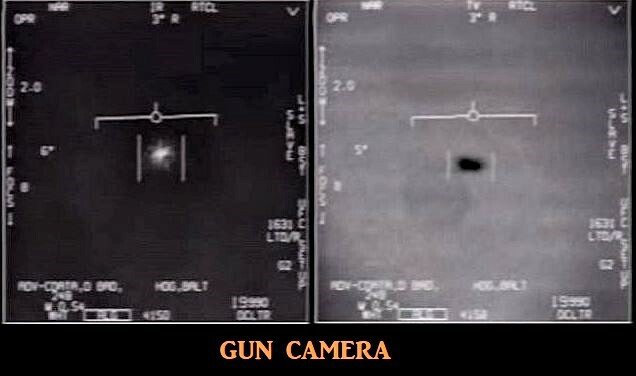 This infrared video was allegedly captured from one of the F-18’s (Fast Eagles 100/110) from the U.S. Navy USS Nimitz Carrier Strike Group-1, involved in the UFO incident. This video was leaked online by an unknown source, but was confirmed to be real by someone with inside knowledge of the incident according to OpenMindsTV. Going fishing in our old 1952 milk truck camper from Webb City to Table Rock Lake on Route 76 outside Cape Fair on the straight part of road high up. I was 16, sitting on the engine cover with my Dad driving. It was 30 mins short of night and straight ahead, I see a very bright star-like object hovering 300-600 meters above the road. We both knew, it couldn’t be a star, it was still too light out. It was at least 8-10 miles away, when I noticed it. It shot of a short burst of flames out to one side, the maneuvered at incredible speeds, up, side to side, down, shot another burst of flames from one side, with more sharp movements. I told my father, it’s our brothers from another planet and they are here, just for me to see. After driving and watching for a few miles, we pulled over in an old mountain top cafe/filling station, the kind with glass pumps. I told my little brother to get all the people out of the cafe and we all stood by the 2-lane road watching it (looking toward the East), not too far from Cape Fair. The bright object (saucer) moved slowly towards us. I was thrilled! A dream come true! Just earlier in the summer, I told my mom, as we looked up at the stars, I wished I could see a space ship one day. Everyone had came out of the restaurant (about 15) and were totally silent as we watched it slowly come to a stop, right above us, about 80-100 ft away. It was an extremely bright metal exterior with no windows. It had a curved sloped dome and was about 100 feet wide and 60 ft tall. The outside edge was about 2 meters thick and rounded. Underneath, it had a dark black ring 4ft from the edge, about 2 ft wide. It didn’t make a single noise or whisper! The cafe had cleared all the trees across the road for a nice few across the valley and about 15 miles to the next mountains to the south. After watching it travel towards us for 15 mins and hovering for 15 mins more, it slowly moved to the south, down the mountain, for a few secomds out of our view, then reappeared down in the valley, flying right above the ground. It started picking up speed and as it approached the next mountain, shot straight up into the sky and out of Earth’s orbit. It was now dusk and the sun was shining brightly off the ship and we could see it for quite a while as it shot up into space. All this time, nobody said a word. At the end, this guy says – “Should we report this to the Sheriff? I replied, “Do you know what will happen to our fishing trip, if we report it? People will bug us for years!” As far as I know, nobody reported this event in Missouri and decided to finally do it! This experience changed my life for the better. I’ve had other amazing experiences since, that I won’t report. Loyalty, means keeping secrets. I had a 27 year career in the Army, Ranger, SF, counter terrorism, intel, and emergency management at the national and international level. I remember the spaceship, like it was yesterday. It helps to have a photographic memory for images and numbers. NOTE: The above image is CGI.